"The Lower Oregon Columbia Gorge Tributaries Watershed consists of the 19 small Columbia River tributaries located between Bonneville Dam and the Hood River. 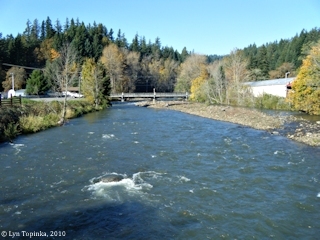 Its major streams are Herman and Eagle creeks. The watershed is located in Hood River County, except for a small part of the Eagle Creek drainage, and includes the City of Cascade Locks and part of the City of Hood River. The watershed covers a drainage area of 63,714 acres or 99.6 square miles." "The watershed encompasses 170 miles of perennial stream and 208 miles of intermittent stream according to the 2003 Regional Ecosystem Office 1:24,000 mapping. ... The largest stream drainages are Eagle, Phelps, and Herman creeks. Numerous small lakes and ponds totalling 110 surface areas are concentrated in the glaciated areas above 3,800 feet elevation. Most lakes are shallow and under twelve feet deep. The largest is the 60-acres, 150 foot deep Wahtum Lake at the headwaters of Eagle Creek. The next largest is the 6-acres North Lake at the Lindsey Creek headwaters." From: Northwest Power and Conservation Council, 2004, Columbia Gorge Mainstem Subbasin Plan, May 28, 2004, Table 1: Name and location (approximate Columbia River Mile) of selected Tributaries of the Bonneville Reservoir. From: Lower Columbia Fish Recovery Board, 2004, Lower Columbia Salmon Recovery and Fish & Wildlife Subbasin Plan, Volume II -- Subbasin Plan, Chapter H -- Lower Columbia Tributaries: Bonneville and Salmon, December 15, 2004. "The Bonneville Tributaries Basin contains the stream systems that drain into the Columbia between the Washougal River and Bonneville Dam. The basin lies within Clark and Skamania Counties. Streams in the Bonneville Tributaries basin originate on the steep valley walls of the Columbia River Gorge and flow south through Columbia River floodplain terraces before entering the Columbia River. Most of the stream lengths are high gradient and spawing habitat is only available in the lowest reaches. The major streams (from west to east) are Gibbons, Lawton, Duncan, Woodard, Hardy, and Hamilton Creeks. Hamilton Creek has the largest channel length at over 8 miles."